Rinne teaghlach Mhaolra Seoighe, a crochadh go héagórach de bharr dhúnmharuithe Mhám Trasna 130 bliain ó shin, iarracht gan toradh a chuid taisí a fháil aistrithe ón áit ar cuireadh é ar láthair phríosún na Gaillimhe, san áit a bhfuil Ardeaglais na cathrach anois, agus iad a chur in uaigh theaghlaigh, de réir eolas nua atá tagtha chun solais i gcomhad sa Chartlann Náisiúnta. Lucht eagraithe na hócáide cuimhneacháin a bheas ar siúl i nGaillimh Dé Sathairn an 15 Nollaig a d'aimsigh an comhad ón mbliain 1943. Beidh ócáid na Gaillimhe ar siúl cothrom an lae, 130 bliain ó shin, ar crochadh Maolra Seoighe -fear a mheastar go coitianta a bhí neamhchiontach sna dúnmharuithe agus a raibh iomrall ceartais i gceist ina thaobh nuair a chroch William Marwood é. Fear céile iníon Mhaolra Seoighe, Seán Conboy, Páirc an Doire i Mám Trasna a chuir tús leis an iarracht a chuid taisí a aistriú ó láthair an phríosúin, tráth a raibh Easpag na Gaillimhe ag tógáil seilbhe ar an suíomh leis an Ardeaglais nua a thógáil. Theip ar an iarracht nuair a mhínigh Aire Dlí agus Cirt na linne sin, Gerry Boland TD, gur in uaigheanna gan ainm a cuireadh taisí na ndaoine sin ar fad a cuireadh chun báis sna príosúin agus nach bhféadfaí tar éis tréimhse ama 61 bliain taisí aon duine ar leith a cuireadh chun báis a aithint. Sa litir lámhscríofa thar ceann an teaghlaigh, rinneadh an cás go raibh Maolra Seoighe neamhchiontach, nár ghlac sé aon pháirt sna dúnmharuithe ach gur le mionnaí bréige a daoradh chun báis é.
Mheas an teaghlach go mbeadh taisí na ndaoine sin ar fad a bhí curtha ar láthair an phríosúin le haistriú ón áit nuair a bhí an Ardeaglais le tógáil ar an suíomh agus theastaigh uathu go dtabharfaí a thaisí ar láimh dóibh le cur i reilig Pháirc an Teampaill i dTuar Mhic Éadaigh. Bhí tacaíocht faighte acu chuige seo ón sagart áitiúil i bhFionnaithe, an tAth. Breathnach, a dúirt leo nach bhfaca sé aon chúis nach mbeadh rialtas Éireannach sásta taisí fir neamhchiontaigh a thabhairt dá mhuintir féin lena gcur imeasc a mhuintire féin. Thairg siad tuilleadh cruthúnais faoi neamhchiontacht Mhaolra Seoighe a sholáthar agus dúirt go raibh cuntas ar fáil ar a fhocail deiridh i nGaeilge, cuntas truamhéalach ar a neamhchiontacht; níor labhair sé focal Béarla riamh, a dúirt siad. Bhí diúltú an Aire Dlí agus Cirt dá n-éileamh i mí Mheán Fómhair 1943 bunaithe ar an eolas go mbeadh sé dodhéanta taisí duine ar leith a aimsiú in uaigh gan ainm tar éis tréimhse ama de bhreis ar thrí scór bliain. "Litir chorraitheach, chráite," a thug an Coimisinéir Teanga, Seán O Cuirreáin - duine de lucht eagraithe na hócáide cuimhneacháin i nGaillimh- ar litir an teaghlaigh a d'aimsigh sé sa Chartlann Náisiúnta. "Tá sé ríshoiléir ón litir gur chreid siad go raibh sé neamhchiontach agus gurbh é mian a gcroí go mbeadh sé curtha i measc a mhuintire sa Ghaeltacht seachas a bheith fágtha mar dhúnmharfóir in uaigh gan ainm. Ba mhór an trua nach bhféadfaí géilleadh dá n-iarratas," a dúirt sé. Tá taisí Mhaolra Seoighe curtha fós in aice na hArdeaglaise i nGaillimh faoin tarmac i gcarrchlós na Comhairle Cathrach ansin. Unsuccessful efforts were made by the family of Myles Joyce, hanged for his alleged part in the Maamtrasna murders 130 years ago, to have his remains exhumed from his burial place at Galway Gaol - now the site of Galway cathedral - and reinterred in a family grave according to a newly discovered file in the National Archive. The file dating from 1943 was uncovered by the organisers of an event to be held in Galway on Saturday 15th December, the 130th anniversary of his hanging, to commemorate what is widely believed to have been a grave miscarriage of justice which led to the execution of an innocent man at the hands of hangman, William Marwood. 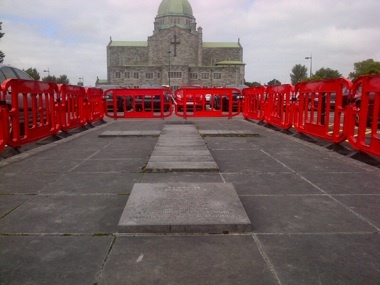 The attempt to have his remains handed over to his family was initiated in 1943 by Myles Joyce's son-in-law John Conboy of Derrypark, Maamtrasna when the gaol site was been taken over by the Bishop of Galway for the building of the new cathedral. The initiative failed when the then Minister for Justice Gerry Boland T.D., explained that since the remains of all executed persons were buried in unmarked graves within the precincts of the gaols in which they were executed, "it would be impossible, after the lapse of 61 years, to identify the remains of any executed person." The hand written letter on behalf of the family had made the case that "Myles Joyce was an innocent man that never took part in the murders, but his life was sworn away on perjured evidence." The family believed that "the bodies of all the executed must be transferred to some other place for reinterment" in order to facilitate the building of the cathedral on the site. They sought that his remains be "handed over to them to have him buried among their own at Churchfield Tourmakeady". The refusal by the Minster for Justice to accede to the request in September 1943 was based on the impossibility of identifying the remains in an unmarked grave after the lapse of more than 60 years. An Coimisineir Teanga, Sean O Cuirreain who found the correspondence in the National Archive said that the family letter was moving and poignant. "Their clear belief in his innocence and their heartfelt desire to have him buried among their own rather than as a convicted murderer in an unmarked grave is evident from the letter. It's very sad that their wish could not have been granted at that time" he said.